U.S General Scott Miller in meeting with Nangarhar governor Hayatullah Hayat on Dec 23, 2018. The U.S. commander of international forces in Afghanistan said Sunday he has not received orders for a troop withdrawal from the country. General Scott Miller’s remarks came just days after reports quoted officials in Washington as saying President Donald Trump has ordered the Pentagon to withdraw roughly half of the more than 14,000 American troops stationed in Afghanistan, beginning next month. 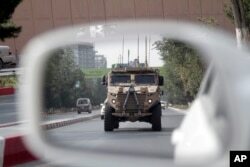 FILE - A patrolling U.S. armored vehicle is reflected in the mirror of a car in Kabul, Afghanistan, Aug. 23, 2017. “You have seen the same rumors I have in the newspapers. But all I would assure you is first of all I have no orders, so nothing changed. We are same today as we were yesterday and we will be the same tomorrow,” Miller noted during a visit to the eastern Afghan province of Nangarhar. The largest Afghan television station, TOLO News, broadcast the footage of Miller’s meeting with the provincial governor where the general was apparently responding to queries from his hosts on the reported U.S. troop withdrawal plans. “But if I do get orders I think it is important for you to know that we are still with the [Afghan] security forces. Even if I have to get a little bit smaller [in troop size] we will be okay. We have thought about this before and we will be able to do the things that you require in terms of support,” Miller said. President Ashraf Ghazi's unity government in Kabul officially has played down the significance of Trump’s reported order of the troop drawdown, saying Afghan forces are capable of defending the country. But privately, Afghan officials and generals are worried their beleaguered forces will find it extremely difficult to sustain battlefield pressure from the Taliban without American troops and air support. Almost 30,000 Afghan forces have been killed since 2015. General Miller, who commands U.S. forces and the NATO-led non-combat Resolution Support mission, reiterated the need for finding a political settlement to end the deadly Afghan conflict. “My personnel preference is that we stop the violence because the people who are paying the price are the Afghan people, in some cases its civilians. But regardless if it’s the Taliban or security forces, the people who are paying the price are the Afghan people.” Miller noted. 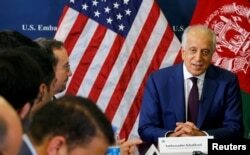 The reports of a possible U.S. drawdown have emerged at a time when the U.S. special envoy for Afghanistan reconciliation, Zalmay Khalilzad, last week held another round of talks with the Taliban in the United Arab Emirates to push for a peace deal to end the war. Both sides have described the latest meeting as productive and anticipated progress in the upcoming meetings expected to take place at the same venue in coming weeks. The U.S. launched its military campaign 17 years ago with the help of its allies to topple the Taliban government following September 2001 strikes on American cities. The longest American war effort has since killed nearly 150,000 people, including security forces, insurgents and civilians, and it has cost Washington close to a trillion dollar in military expenses. The Taliban has expanded its influence and currently controls or hotly contests more than half of Afghanistan.